Yesware’s Salesforce integration goes deeper than your emails –- we now let you sync your newly created Outlook calendar events (and event updates) directly into Salesforce within a matter of minutes! 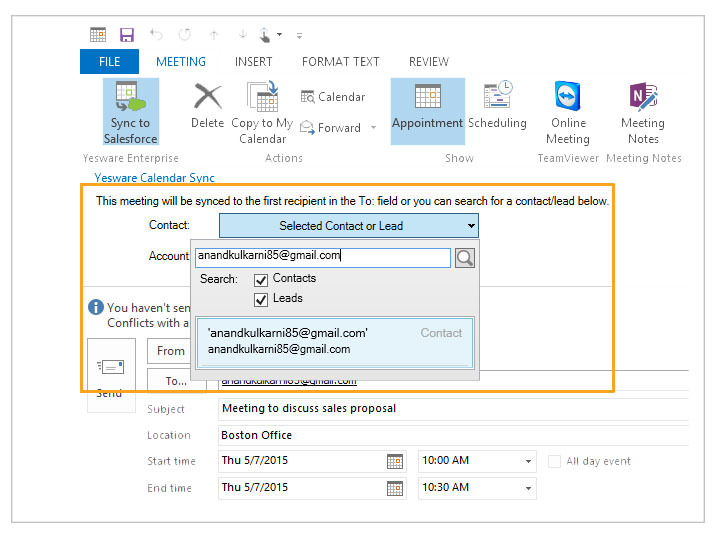 When creating new events in your Outlook Calendar, just choose the correct contact/lead and account/opportunity to associate with the metting, and we’ll automatically add the activity in Salesforce for you. Note: If the user does not manually select the Contact or Lead, Yesware will sync the meeting request with the account in Salesforce associated with first email address listed in the “To:” field of the calendar invite. Any edits made to a synced calendar event in Outlook will be automatically reflected in Salesforce as well, saving you an additional step when updating calendar events. 1. 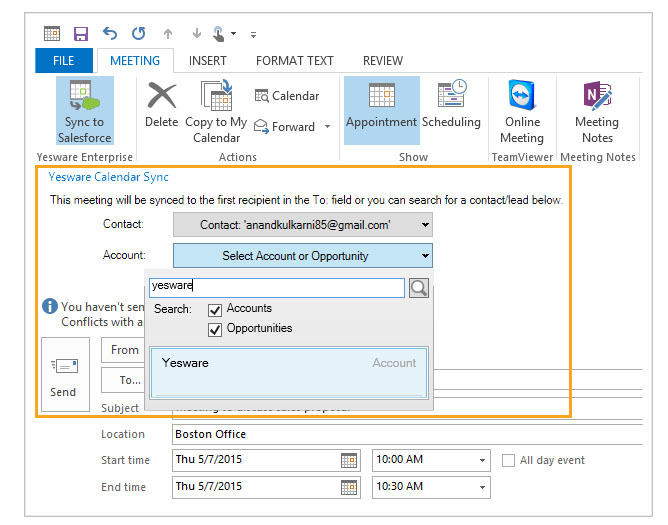 While creating a new calendar meeting in Outlook, click the “Sync to Salesforce” icon in your Outlook ribbon. 2. Select the correct contact or lead in your Salesforce environment to associate the meeting with. 3. Select the correct account or opportunity in your Salesforce environment to associate the meeting with. Any questions? Submit a request through our Help Center and we’ll get back to you as soon as we can.